The current cost of injuries and ill health to UK businesses is estimated at £14.9 billion*. Did you know that as an organisation, you are legally required to comply with the Health and Safety (First Aid) Regulations 1981? 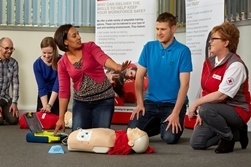 The regulations govern the provision of first aid by a business to their staff and apply to all workplaces, regardless of size. You never know when you might need to put your skills into action, as Matthew found out when he found someone collapsed at the wheel of a car. Matthew said, "I wouldn't have had a clue what to do in this situation if I hadn’t learned first aid. The knowledge I gained on the course kicked in and gave me the confidence to help save someone’s life." With winter just around the corner, you can help ease the pain of workplace accidents by signing up to receive our free, winter first aid pack and poster and help ensure your team are prepared whatever the weather.